Anthozoans are probably the most famous cnidarians: they include the corals that build great reefs in tropical waters, as well as sea anemones, sea fans, and sea pens. They also have a long and diverse fossil record, extending back at least 550 million years. The oldest anthozoans are probably some of the polyp-like and sea pen-like fossils from the Vendian (late Precambrian). A few tens of millions of years later, in the Cambrian period, the first mineralized coral-like organisms appeared. True corals of the kind living today did not appear until the middle Triassic, at about the same time that the first dinosaurs were evolving. For more information on the Anthozoa, click on the buttons below. The Anthozoa page from the Tree of Life Site is worth checking out. The Biogeoinformatics of Hexacorallia site at the University of Kansas is an excellent resource on this major group of anthozoans. 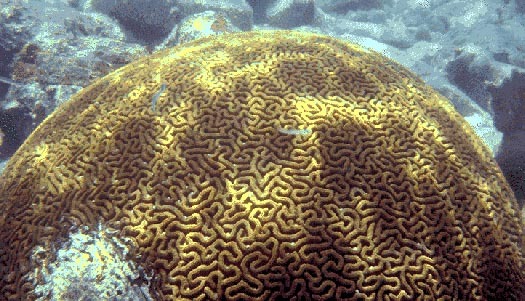 Read more about corals and coral reefs at this SeaWorld site.